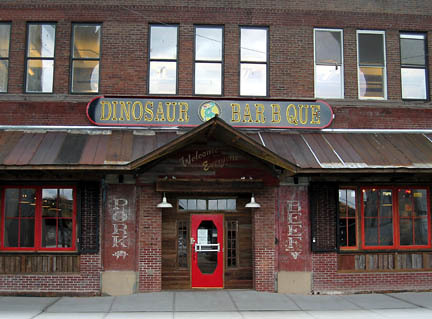 Way back in August I noticed that Dinosaur Bar-B-Que of Syracuse was going to open a location in New York. The restaurant opened a couple of weeks ago and I finally got a chance to eat there this afternoon. 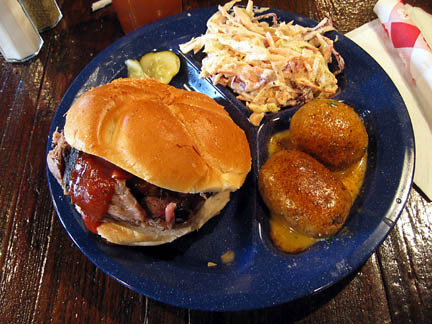 I had the Pork Bar-B-Que sandwich with two sides (salt potatoes and cole slaw) and a sweetened iced tea. The pork was tasty but a bit dry. 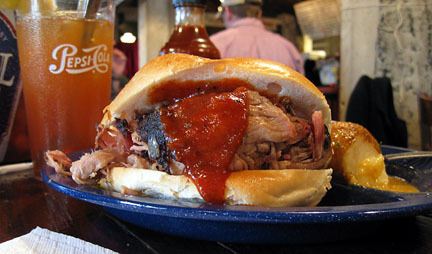 As a barbecue snob I was upset to see sauce on the sandwich. The sauce is good, but you shouldn't need sauce if the meat is any good. The kaiser roll was completely wrong as it put up a battle with the barbecue instead of succumbing to it as white bread would have done. There was also way too much bread for the amount of meat. After a couple of bites I scraped the meat off the bread. The salt potatoes were excellent. If you're not from the Syracuse area, salt potatoes are potatoes boiled whole in extremely salty water. The salt raises the boiling temperature so the potatoes cook at a higher temperature. The potatoes aren't salty, however. The cole slaw wasn't what I was expecting, it had some spices unknown to me, but I really liked it. I had only contempt for the sweetened iced tea. Does anybody north of the Mason-Dixon Line know how to make sweetened iced tea? The tea was cloudy, meaning they made it by pouring ice into hot tea. It was also bitter, which is odd for sweet tea, probably because it steeped for too long. Hey, I said I was a snob! That said, Dinosaur BBQ is better than 90 percent of the BBQ places in New York. I'll certainly give it another try. Perhaps one of the rib plates so there's no bread involved. The price was very reasonable. Only $7.95 for the platter. The slaw looks interesting and good. We don't know what salt potatoes are back here, so thanks for that. Cloudy tea makes me suspicious, so I never drink it (if I don't make it myself, I'd rather just have the canned variety). As for the BBQ pork, just give it to me without the bread every time. And, substitute dill spears for the bread and butter pickle slices. When making your argument, you can usually disarm your opponent if you point your pickle spear at them as opposed to your finger. This works good at lunch counters. As for your sauce problem, I agree the sauce should be self applied (though I do like the sauce). The ribs are served with a light glaze over a great rub. I can eat the whole rack without sauce. And the salt potatoes were fantastic, that's why I found your blog... googled for "dinosaur salt potatoes" to try and find a recipe =) I picked up the Dinosaur cookbook a year ago, but they don't mention salt potatoes there. Well, not leaving NYC until after 1 p.m. meant no Syracuse Dino BBQ for me. Marie: Those weren't ordinary bread and butter pickles, those were "house-cured garlic-dill pickles". Three tiny slices. Dom: Thanks for the suggestion, next time I'll go I'll get the ribs. You gotta go to Oakland to get BBQ. Romy: Ha ha ha ha ha ha ha ha! They do serve a chopped salad, greens and vegetables topped with spicy pecans. Caren: Despite some reservations I did enjoy the food. Next time it will be ribs, beer, macaroni salad, and baked beans. I had a chance to go to the opening party for Dino BBQ and try lots of different entrees, and though I found the food delicious, was overwhelmed with the feeling that it somehow didn't "belong" in New York--so spacious, hokey decor, etc. (This might just be a problem with BBQ places in NYC in general...) I haven't been to the one in Syracuse despite going to Cornell, but can see how it'd fit right in there. That said, if it weren't so far uptown, definitely fun for a big, hungry crowd. AAAACK, that wasn't me saying it looked good!!!!! I recently moved to Georgia and cannot find a place that even compares to the Dinosaur. If you don't want bread on your pork, order the pulled pork plate.....YUMMY!!! I was surprised by the slaw at Dinosaurs too. Wasn't what I expected. I also found the meat a little tough. I was spoiled by Flint's in Oakland/Berkeley where the meat literally melts in your mouth. Dreamy! The closest I've found here is Virgil's...smoky flavor and good consistency. When Puffy's mom had the place in Brooklyn she had pretty good ribs too. As far as sweet tea...it doesn't taste the same north of North Carolina. Must be the water or something. Everything taste better in N.C. and Ga. in my opinion though. got a sense of humor?" "I don't have to laugh," she said. "I'm leaving Friday anyway.